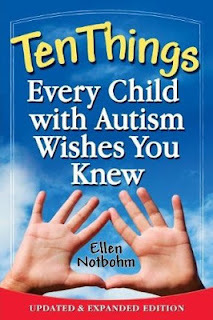 "Ten Things Every Child with Autism Wishes You Knew"
This is quite an unusual book. It's not a practical guide to handling day to day issues with Autism, nor is it a dry clinical description of Autism. It's essentially a book promoting a new paradigm, (a whole new outlook) on Autism. It provides you with an understanding of some key positive concepts and then goes on to show how they can be put into practical use on a daily basis. 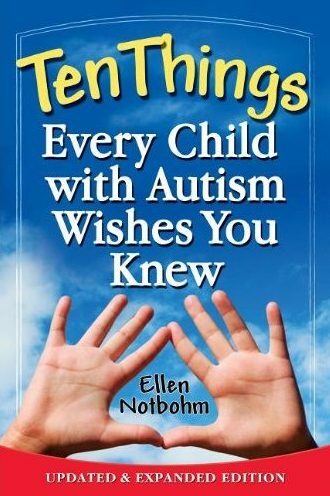 I feel that this book could be better described with the considerably less catchy title of; Ten concepts which your future happy and successful grown up child with autism needs you to know, understand, believe and "live" now - in order to ensure that the time line works out for the best. Make no mistake, these aren't ten baby concepts which will only hold true for a small part of your child's life. They're adult ones, mantras for living - and they apply forever. The book starts with a list of the 10 things which I'll list below because there are no surprises here. They're the names of the chapters and are prominently displayed on Amazon. You'll notice that every one of these ten things is open-ended. Each topic contains a lot of important discussion material. I won't say that I agreed 100% with everything but the later chapters put all of my minor niggles to rest. Ellen makes it clear at the beginning of the book that all children are different and that not everything here will apply to every child. This book spends quite a bit of time discussing the "language of autism" as it used by parents, media and support personnel. It makes it very clear that the way in which we express, embrace and encourage our children has monumental impact both on their self esteem and their future success. Often we use negative language without realising it and the book provides some handy hints on how to detect and remove these negative words from our daily interactions. If you've ever used a phrase like "my child suffers from autism", then you really need to read this book. Similarly, if you've said; "my child will never do that". The subject of the book is Ellen's son Bryce and by reading between the lines, you can follow his journey from a child seen as a PIA (Potentially Independent Adult) to a fully functional, self-supporting adult. There are some wonderful "bonus chapters" in the book including; "Ten things I want my high school senior with Autism to know" and a great chapter called Evolution which really presses home the problems of limiting language. Finally, the book ends with some discussion questions which are really worth thinking about. If it all sounds really technical, don't worry, it's not. In fact, it's quite an easy read at just under 200 pages and a really easy-going font but it's a book that will get you thinking and it's a book that could change your life. It probably should be required reading for all parents of children on the spectrum. Note: the older 2005 version is available there too, and in a kindle version but I think that the changes in the updated version are significant enough that I'd recommend that you get the 2012 version. I hate the myth that all autistic people are visually oriented, many of us aren't. That's a stereotype. I don't think my senses are always out of sync even if they are very different from non autistic senses, many times my senses are more effective and I filter less. I had two issues with this book, one was a sentence which suggested that we lack empathy and the other was the idea of literal language interpretation. The empathy thing was a one-liner which I suspect was a typo since it's never raised again and it's completely out of sync with the message of the rest of the book. The language thing was harder to dismiss because it was an entire chapter. I dismissed it in the end because there is an "everyone is different" disclaimer at the front. Yes, being visually orientated is a stereotype but in Ellen's case it was true. Nothing can 100% describe an individual (otherwise there wouldn't be such a concept as individuality). Nevertheless, it is a good book. Thanks for posting this. I enjoy your blog when I have time, and this book in particular sounds like one I would enjoy reading or having as a resource. My son is high functioning, but we struggled a few years while trying to get his school to understand what was going on with him and educating them. He is in a new setting and all those chapter titles seem to be covered now, but sounds like it would have been nice to see this earlier on. Never too late.